It may not sound like the most exciting part of playing the guitar, but how you pick the strings has a big effect on both rhythm and lead playing. 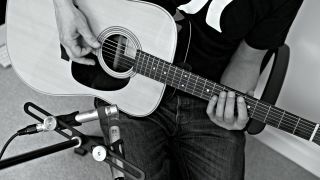 And, whether you’re an aspiring shredder or you prefer a relaxed campfi re style jam, certain principles are the same for every guitarist who uses a pick - in particular, timing downstrokes and upstrokes. Think of a bar of music (in 4/4 time) divided into 16 equal rhythms - these are known as 16th notes (aka semiquavers). Generally 16th notes are quite quick, so playing down-up-down- up is loads easier than constant downstrokes. As for constant upstrokes, well, no one really does that anyway. This down-up approach is known as ‘alternate picking’ and you can use the technique with a whole variety of rhythms. Simply avoid contact with the strings on one or two pick strokes for musical effect. So get stuck into the following tab exercises where we take a look at a mixture of single-note and strummed ideas. Keep your pick hand strumming in a constant down-up motion, following the underlying 16th note rhythm. The challenge here is to miss the strings as needed - for example, the opening Badd11 chord lasts for eight 16th notes but you only strum five times. The down and up picking directions under the tab should help you. This is a variation on the strummed line but you’ll be using smaller picking motions because you only play one string at a time - that means it’s more of a soloing technique. The principle is exactly the same however, so your pick should move in a constant 16th note motion, missing the string as required. This funky riff stresses some of the offbeat notes (played with upstrokes) - a musical device known as ‘syncopation’. Once again we’re using 16th notes, so continue with down-up style picking - it’s just the emphasis that changes. This more musical version of the trusted spider exercise is designed to help coordinate both hands. With syncopated rhythms and combinations of all four fretting fingers, it’ll really test whether both hands are tightly in time. Our examples are at 70 and 90bpm, but don’t be afraid to start at a slower tempo or build to a higher rate. If you struggle with the timing of the exercises try counting along. The 16th notes can be counted out loud (quite quickly: 1 e & a 2 e & a 3 e & a 4 e & a. It’s just a matter of syncing your count with your picking movements. Slowing down until you get a feel for it will help.